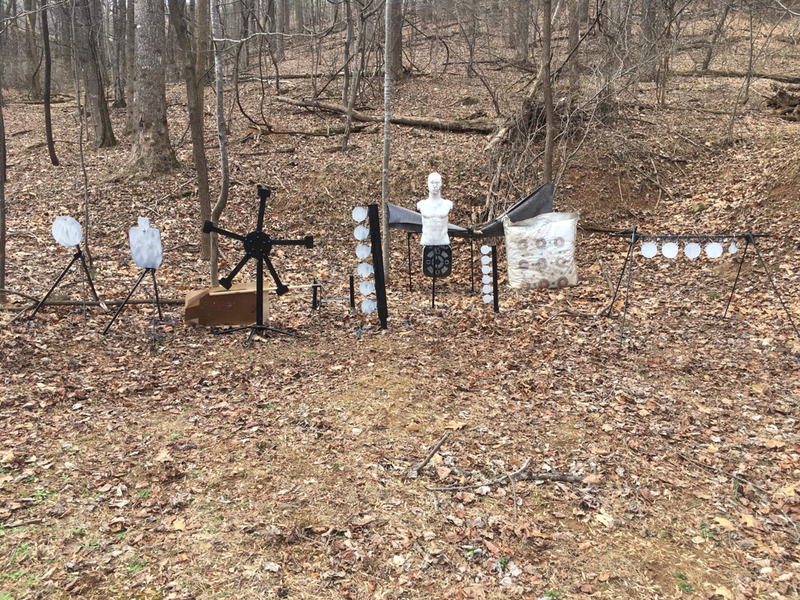 Building an outdoor range: How close from my own house? I have purchased about 155 acres and I'm in the process now of building a new house. One reason I'm moving is to build an outdoor shooting area. 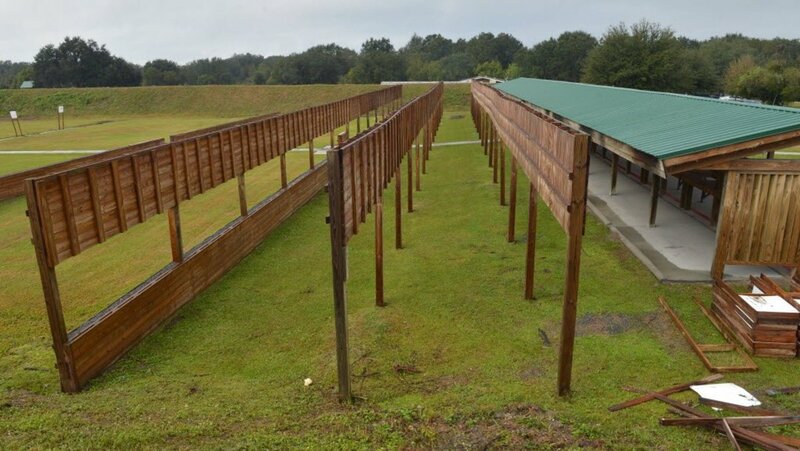 I am thinking something that is 100 to 250 yards long set up with good steel targets to shoot handguns (shorter distances) and my AR or AK occasionally. My wife is very supportive but we continue to have discussion around how close or how far away the range should be to the house. We have 3 children (ages 12 and under) so they may be outside playing in the yard when I'm shooting at the range. But I don't want the range so far away that it will be a hassle for me to carry equipment to it, etc. These 155 acres are mostly all wooded and I don't want to clear a bunch of space unnecessarily as I generally want to keep trees up, so I plan to clear enough for the house, the range, driveway, etc., and generally leave the rest untouched. If people are in the back yard (wife/kids), I don't want them to have to wear ear protection if I'm shooting, but we all agree it's ok if they hear the noise in general. I know a lot is subject to the environment, the caliber, acoustics, etc., but I guess I'd lob this up as a general question to see if anyone has experience with it. I'm a newbie to the forum and this is a first time post. Hope I didn't word or post this in an incorrect way. Re: Building an outdoor range: How close from my own house? Myself, I'd like to be able to pop open my bedroom window, and get my range time in, without even having to get out of bed. But, then, I can be eccentric. I have a relative who has an informal range, in the front portion of his side yard (or side portion of his front yard, depending on where we choose to stand, that day). Either way, shooting is done pretty close to the house. On days that extended family isn't around in large numbers, he just shoots from the front porch. It's probably worth noting that his house, and relatively small yard, are surrounded by trees, possibly similar to what you envision for your property. Really, it just boils down to personal preference, and what your wife is willing to tolerate. There is no definite answer that you can get from a bunch of random guys on the internet that you have never met. We do have a member that has built a personal range, though. I imagine that he may chime in on the topic, and may have some practical wisdom for you to consider. Welcome to the forum. You'll find us to be fairly laid back, occasionally opinionated, friendly and civil. Thanks for the good info. I really appreciate it. "Nobody wears earplugs, unless they are standing within 10-15 feet of the active shooter (or, are the shooter, of course)." I told her I thought with acoustics, other structures between the range and the house (a planned detached garage) that I thought it would be safe for people to not wear ear plugs. If you are within 10 to 15 feet we should be fine. The way I have it planned right now, I want to shoot appropriate steel targets for handguns and long guns, and I'm planning on it being about 100 yards long with a berm (still working on dimensions). The shooter would likely be about 50 to 100 feet from the driveway/house area roughly. Appreciate the info and the welcome. Just for the sound reference I have about 50yds to shoot in my back yard. I only shoot handguns and 22lr. Generally shoot the 22 from the back porch and the wife hardly notices it. Handguns standing in the back yard are noticable inside but not loud enough to be annoying. Hopefully our member who has built an actual range will chime in with some advice. That sounds great, good luck! I have looked into making my own range, but have not been able to buy the land yet. Setting up some kind of small pavilion, or a 3 sided shed, might help with the noise also. Welcome to the club, ramblinmanva. My wife and I have a cabin on 20 acres. My range is 50 yds. Where I shoot my 22lr rifle from is 15' from the picnic pavilion and 30' from the cabin and no one has been bothered by the noise. If we are shooting pistols, we move closer to the targets and farther from the cabin. 22lr, .380, and 9mm handguns are not bad, but my .45LC can be a little loud. I would think that if you are going to have a garage between the yard and range, you should be OK. I have a 100 yard range behind my house, facing away from the house. The bench is about 30 yards from the house. I shoot rifles mostly, and the noise at the house is not bad. I have thought of setting up a noise baffle, shooting through a plastic drum lined with foam. So far I haven't had any complaints so I haven't made it yet. My father found that a S&W .44 magnum is darn good at taking down a 6" diameter pine tree. Unfortunately he left a 4 foot high stump. Short version: At a resort we used to go to he went out to a quiet area, tacked a target on a pine, backed off about 15 yards and fired six rounds. Due to not wearing his cervical collar he got a splitting headache (low blood flow) so packed up and went back to the lodge. The next day he returned (wearing his collar) but couldn't see his target from his shooting line even with his spotting scope. He walked out and found most of his target on the ground still attached to the tree and a tall stump. BTW - that's short for me. I tend to be verbose. Building on 155 acres , your options should be endless. I always liked shooting in the woods. It seems better to keep the natural sound barriers and clear only what is necessary. I've had Ranges at just about everywhere I have lived. The first thing to consider is the lay of the land using a ridge or natural mound as a backstop. It can take a lot of time to build a berm. If you have a place to dig dirt on your land instead of buying can save you $$$$. I'm always working on my berms but , I have a pit for the dirt and a loader on my tractor. My Range is a couple hundred yds. from my Cabin and is on the border of my property. There's a 60 acre field that borders most of the length of my range so I am in a pretty secluded spot. I have a raised shooting platform with a roof over it.....Protection from rain , sun and gives me a place to leave things there . I have a Gator that I haul my Stuff to the range so I really don't mind being away from the Cabin. I use to build Custom Golf Carts and they make great Range vehicles and can be bought fairly cheap too. I shoot steel targets made from RR track plates hung with chain for best shooting . I also get pretty regularly old oxygen /gas bottles and cut them in half. They ring like a bell when shot. BE REALLY CAREFUL shooting steel at close range !!! Looks like you've got quite a few excellent thoughts. I've never had a range, nor a property large enough to build one so I don't have anything "range specific" to offer. One thought I did have concerns local acoustics. Hear me out (okay, bad pun). We live in a relatively flat area i. e. I have no natural rises around me. That said I've noticed some strange acoustics around the house. Some places I can whisper and be heard on the other side of the house. It is not a small house either. Other places nobody hears my if I yell. It is is weird. With this in mind, my suggestion is to pick out several likely spots and shoot off a few rounds with your wife standing in a location where she would likely be around. You might consider trying several different types of firearms as there may be some difference in sound between say a rifle and a shotgun. If you don't mind, let us know how things turn out. Arsenal? Isn't that like playing with fire? I live on nearly 30 acres, roughly 90% woods. I put in a range a few years ago. It is a short one, exactly 50yds from the end of the shooting table, to where the targets are hanging. I also put a couple benches in the ground for spectators, & a standing height table for pistols, & paraphernalia. That portion is about 6 or 7 yds off the targets, & off to the side of the main lane. The primary rifle, shooting table, is roughly 100yds from my front door, with the lane traveling away from my house. You can definitely hear shots being fired from inside the house but, I hear shots when my neighbors pop off rounds, & I don't have any neighbors in eye shot. You really only need ear protection if you are, a. the shooter, or b. right up on the shooter. This set up has been in use for a few years now, & has worked out well. It's close enough, it's an easy walk even for seniors yet, because it's slightly hidden in the woods, plenty of people could come up to the house, & not even know it's there. Here's a couple pics when it was first built a few years ago. The first pic was before I got the clasps that I now use. The pictured clips only lasted until I got a box of clasps like you would find on a clipboard. I have two on each target holder (top & bottom). Works pretty slick. So far have only had to replace 2 of em Easy peasy. This next pic shows the backstop. The "box" is full of sand. The top few inches are topsoil, with grass, errr weeds growing out of it now. Last pic is from the table view. Not the coolest set up I've seen but, suits me fine. I've thought about adding some lighting. Still haven't made up mind yet. SHMV- "Myself, I'd like to be able to pop open my bedroom window, and get my range time in, without even having to get out of bed. But, then, I can be eccentric." That ain't eccentric, that's living in the lap of luxury. I used to do something like that with my Crossman Air rifle but I don't think I'd try it with a true firearm. I had an on going war with a clan of ground squirrels (what a lot of people call chipmunks but aren't) when I first moved into a house in the Akron Ohio area. On weekends I would sit in my dinning room window and pick off one or two. Got pretty darn good with that thing. I have set up a range in my property. I only have 7.7 acres but I have a “second home site” nestled in the midst of a bowl (high hills). I set up my IDPA targets, Texas Star, two Dueling trees, two plate racks, and other steel targets. People used to use my land as a cut through to get to the other side. Funny...people don’t anymore. CDRGlock wrote: I have set up a range in my property. I only have 7.7 acres but I have a “second home site” nestled in the midst of a bowl (high hills). This was before I added a lot of other stands and targets.